•In addition to the standard cog control curve, there are mid spine and shoulder controls as well. •The Mid spine controller is for the upper body armor, the shoulder control is for the arms/cape. •Neck control curve is there to adjust any stretching ocurring from moving the head too much. •Show/Hide Cape Controls and Show/Hide Armor Control are channels on the cog control curve. •Top of the cape node is both point and orient constrained to allow for adjusting, remainder of cape controls are orient constrained only. •Armor controls are for adjusting the leg armor in case the leg geometry penetrates the armor. •Head control curve has JawOpen channel, for animating the opening/closing of the lower jaw. •Head control curve has JawSide channel, for animating the left/right rotation of the lower jaw. •Head control curve has NoseUpDown channel. This essentially allows for upper jaw movement, and while anatomically incorrect, I thought it would aid facial animation. •Head control curve has NoseSide channel, allowing for a nose wriggle or additional facial movement. •Show/Hide Facial Controls - channel on the "head" control curve, toggles visibility of ear, lip, cheek control curves. •Lip and cheek control curves may be either translated or rotated to acheive desired state. •Ear control curves are split in half, bottom half controls ear as a whole, top half controls ear tips. •There is a selection handle near the base of the tail, use it for overall tail positioning. •Set the TailClusters channel to 1 to display the tail's clusters and animate them for detailed positioning of the spline ik. •Both foot control curves have toeBend and toeTurn channels. 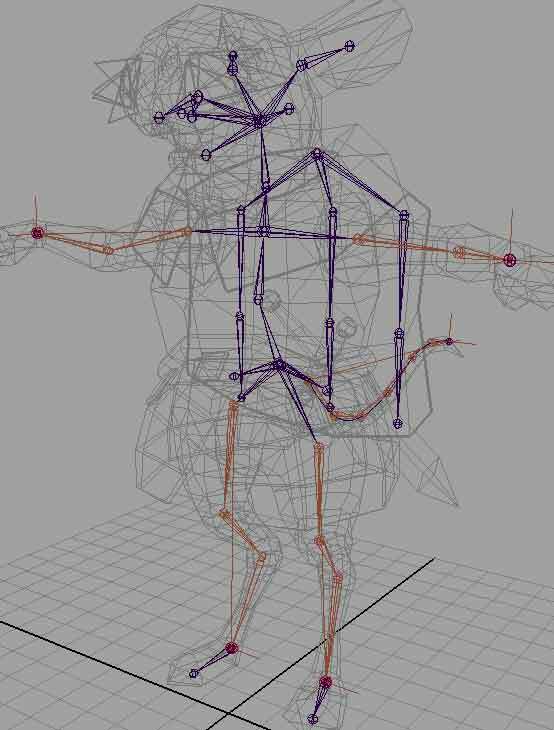 •Due to the four joint legs, the pole vector locators must be positioned behind the character. •Cog controller has a Sword channel setup with a driven key, 0=sword in sheath, 1=left hand, 2=right hand.